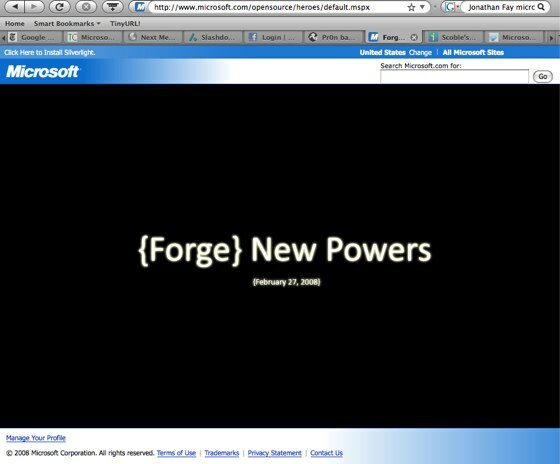 First Scoble writes about something so amazing from Microsoft it makes him cry and will be world changing. Then Long Zheng spots the above page via an email pitch linking to opensourcehero that redirects here. Microsoft Next Media Research group focuses on exploring what new consumer media experiences are possible with the growth in computing power, connectivity and storage in a compelling, elegant and transparent way in the 3 to 10 year timeframe. The group envisions consumer information and entertainment experiences not available today and builds or combines technologies from other Microsoft Research groups and crafts intuitive user interfaces and compelling scenarios to deliver that experience. Rather than focus on old media or new media, the group attempts to develop working prototypes of the Next forms of media possible from new convergent technologies, hence the name. Scoble: “If I told you today what they were doing, without showing you the video we’ll have up on March 3, you’d tell me “that’s lame Scoble.” It’s 100% involved visually, and likely interface related. Scoble: “Buzz Bruggeman, CEO of ActiveWords, was the first to tell me about,” ActiveWords knows about it, and is an interface improvement provider. Scoble: “In Wong and Fey’s work you’ll see techniques that lots of startups are using and, even, that the Google Map team is using,” got to be visual, possibly 3D. In my earlier post on Scoble crying I guessed Silverlight or online Office. It might be something powered by Silverlight, but I’m now changing my predictions. It’s either an amazing online astronomy program, or it’s heavily interface related to I don’t know what. Guesses given where Fey and Curtis work: media management in images, audio and video.